The blueprint of 2 downtown New City projects in Sanya will be submitted to the Sanya government for approval at the end of this month, reports hinews.cn. The projects include Yuechuan Area project and Sunshine Coast Area project in Sanya Bay. 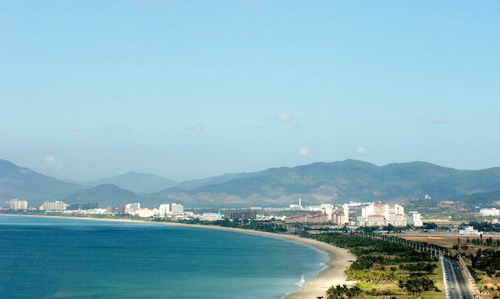 According to the designing plans, the Yuechuan District project, which covers an area of 13.14 square kilometres along both sides of Sanya River, will be developed into the city’s core area with a comprehensive functional zone which has shopping malls, entertainment venues, green landscape belts in the future. Besides, 5 parks including Jinjiling Park in the middle area and Yuechuan Wetland Park will be distributed around the area, which will give a full play to the natural resources in Sanya. The Sunshine Coast Area, located in Sanya Bay, will be designed as an Ocean City to welcome global tourists. The project will take an area of 167.99 hectares. Seaside resort hotels, a bar street, a theme museum, shopping malls, culture and art areas in seaside style and festive plazas will be located here. After the construction is completed, this area is undoubtedly become a landmark tourist destination in Sanya Bay.